I love sweet potato. In fact once you have cut sugar out of your life you can actually taste a subtle sweetness in sweet potato. I find they give me a great rush of energy and are great pre-workout. The only problem is how to best consume them in the morning for breakfast. Well the answer came to me and I wondered why not in pancake form. My search for Paleo Sweet Potato Pancakes began and to make things even more difficult I had to make them flourless as I was running low on stock! After playing around and a few failed attempts I found the solution and that is in the form of a light fluffy and optionally sweetened (naturally of course) flourless pancake. You can dress yours up or simply have them as is, its up to you. If I am feeling naughty i will drizzle some maple syrup on top, otherwise just bacon and eggs does me just fine. 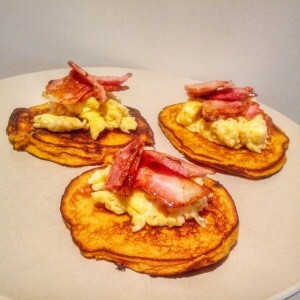 Paleo Sweet Potato Pancakes … whats the secret? To be honest it is going to help for most my recipes if you have a food processor. I am a modern caveman after all. The more ingredients I can throw into a bowl and switch a button on to mix it all together… the happier I am We are all short on time, so I always keep that in mind when playing around with recipes. Also take note that I mention microwaving in the recipe too, this is optional and is also for time poor people in a modern age. If you do not own one or are against it then simply boil the sweet potato for about 15 minutes and then continue on with the recipe. Check out the recipe and instructions below. This recipe is by far one of my most popular and tasted great. Let me know how you like them. Breakfast, Recipes bacon, breakfast, pancake, sweet, sweet potato. permalink. Oooh! I have so pinned these! I love sweet potatoes (though I find them more than subtly sweet! ;-p) and absolutely love that these are flourless! Great share, thanks!